Where are you on this IoW curve? 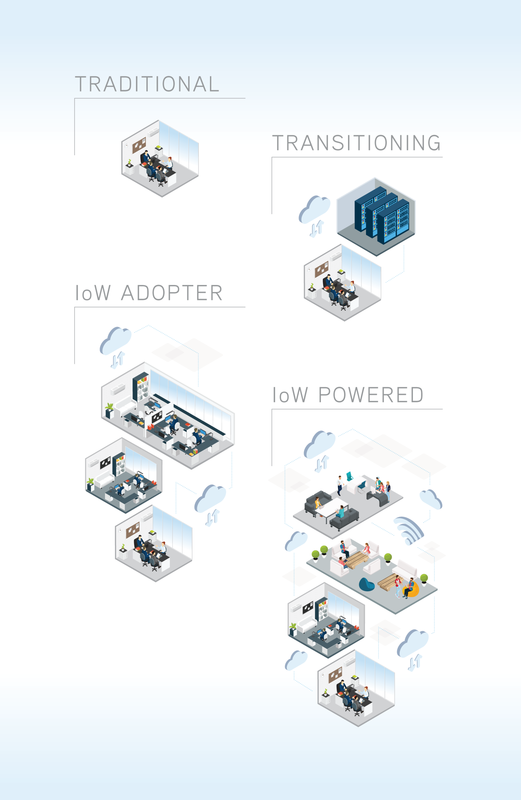 Applying the IoW gives enterprises the ability to ‘cloud the workforce’- adopting decentralised structures that mirror the cloud computing environment, based around multiple remote teams that can be rapidly combined or scaled as needed, rather than a large central office. Like any transformation, clouding the workforce can prove disruptive for enterprises themselves and the commercial real estate industry, upending longstanding business models, and forcing landlords and occupiers to adapt to new demands. Through careful planning and the right approaches companies can navigate this disruption while capturing the benefits of the cloud – a journey that will be explored in this paper. Cloud computing refers to the delivery of information technology services over the internet, with data stored on a network of remote servers rather than on a physical server or personal computer. On the cloud, computing resources are effectively limitless and services can be delivered anywhere with an internet connection, on an on-demand basis. There are three main categories of technology supporting the IoW, all of which can be adopted, deployed and combined in multiple ways. Cloud computing solutions can be broadly divided into public, where a company’s requirements for applications, infrastructure and data are entirely hosted on a vendor’s servers; and private, which organises an enterprise’s technology infrastructure on a dedicated, walled-off network providing greater control over security and storage. 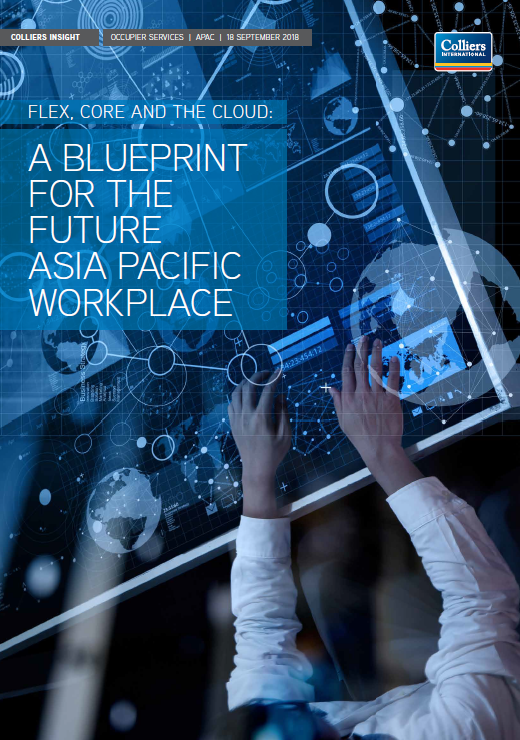 Many firms adopt a hybrid approach; by this year an estimated 80% of banks in Asia Pacific are expected to migrate to a hybrid cloud architecture. Collaborative software includes communication and productivity services such as video conferencing and document sharing, typically delivered via the cloud through a subscription-based software as a service (SaaS) model. Smartphones, laptops and tablets are constantly becoming more powerful and more companies are adopting ‘bring your own device’ (BYOD) policies that allow employees to use enterprise applications on their personal devices. This has further reduced the dependency of employees on dedicated workspaces to perform their duties. It is also allowing companies to replace bulky desktop CPUs with products such as thin clients and laptop docking stations that enable employees to ‘plug and play’ at any desk and reduce dedicated floorspace needs. Given the potential benefits, it’s no surprise to see more enterprises, including landlords, exploring a variety of IoW strategies. Swiss food giant Nestlé is migrating to the cloud and introducing IoW systems and devices across its global locations. Laurent Bischoff, Nestlé’s Digital Innovation Lead, says the firm is piloting features such as phoneless desks, encouraging employees to instead use Skype to make calls from their mobile or laptop devices; automated meeting room booking systems; and sensors that track humidity levels in the workspace. While the IoW promises advantages, clouding the workforce is not necessarily something enterprises should adopt wholesale in the pursuit of digital transformation. There is no ‘one-size-fits-all’ IoW blueprint, but several models that should be considered and chosen from (or blended) based on the needs, priorities and commercial context of each organisation, as well as the demands of employees and customers. Because of the sensitivities involved, those in the field say the IoW is best approached as an incremental process, giving the enterprise’s people, technology and procedures time to adjust. This means firms are likely to move through various ‘stages’ of IoW, with some stopping partway and others carrying on to the end. These choices will have less to do with size or sector than each enterprise’s circumstances, agility and appetite for change. With the IoW trend taking hold, both landlords and occupiers will have to adjust their operating models and strategies to meet evolving demands and grasp new opportunities. “It’s easy to get on the cloud, but your costing models need to be right to support scaling-up,” explains Amit Chopra, Head of Information Services at the Singapore office of global insurer Manulife, which has recently started the process of migrating to the cloud. “Experience shows that big bang approaches have not really done well in this space and it’s better to start small,” says Chopra of Manulife Singapore, which is planning to migrate non-critical, web-based applications to the cloud to start with while considering an eventual move to a virtual desktop infrastructure in coming years". Laurent Bischoff, Digital Innovation Lead at Nestlé, which is migrating to the cloud and introducing IoW systems and devices across its global locations. According to Bischoff, the firm is piloting features such as phoneless desks, encouraging employees to instead use Skype to make calls from their mobile or laptop devices; automated meeting room booking systems; and sensors that track humidity levels in the workspace.